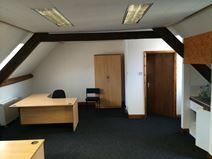 Situated in a building on Witneys Market Square, these 2 offices are within easy access of shops and public transport. This modern building consists of office spaces equipped with state-of-the-art technology, high speed internet connection and the latest telecommunication solutions. They are provided with copy and printing facilities, a meeting room and a kitchen. Situated along the main ring road, this building is surrounded by superstores, a sports centre and a variety of other amenities. Based in the market town of Witney, this centre offers workspace for up to 20 people. The centre has a wide range of amenities available, including a great onsite management team who can offer administrative support and a range of services. Additionally, the centre is 24-hour access, has meeting, breakout and boardroom space and kitchen facilities. Witney has a variety of shopping and dining options, just moments away from the centre and is also just minutes from the A40. This serviced office centre is situated on an industrial estate to the north of historic Windrush. The brand new centre provides a range of adaptable office spaces on flexible terms.